As promised, the Tech N9ne Bad Season mixtape presented by XXL magazine, and quarterbacked by 50 Cent’s DJ Whoo Kid, hit the web last week–two days earlier than previously expected and fans went to the web to show their appreciation. Drastiq_J said: “Thanks XXL and Tech! This is pretty much the only damn thing I’m getting for xmas. I know it’s gonna be awesome! article mentioning the role XXL’s Vanessa Satten played in introducing Tech N9ne to her peoples and Travis was quick to show his appreciation for exposing his favorite rapper to XXL Magazine and the likes of 50 Cent and DJ Whoo Kid. EDITOR’S NOTE: We understand that some of you fans were concerned with the compression quality with the mixtape and we’re doing our best to find a solution. 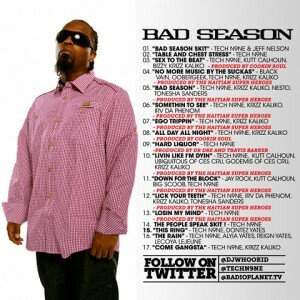 What did you think of the Bad Season mixtape? How would you rate it compared to Tech’s other releases? What about for 2010 releases, how does Bad Season stack up? Did you post a comment on XXL’s post? What do you think of Tech getting all of this attention with the Bad Season mixtape? Did you see some of the noteworthy comments we missed? It’s not too late to be a part of the record setting post on XXLmag.com! 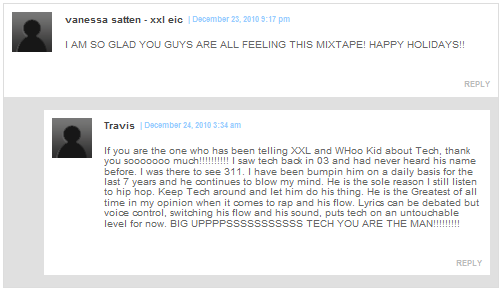 Go here, post your comment and show your support for Tech N9ne and the Bad Season mixtape!